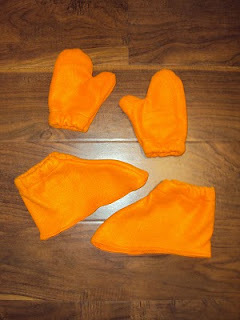 Today was spent making the mittens and shoe covers. I'm not sure whether these mittens will stay on for more than 2 seconds, and I was on the fence about even making them, but I did anyway. I had to add elastic to these, just like the sleeves. This is the only pic I can show today! I also made the "thing" that's going on top of the hood. It looks pretty good, considering I made it from scraps I had laying around! Next...the dreaded details. I have no idea how I'm gonna do it....time to transform from orange blob to "the thing"! Wish me luck!! p.s.....Even though this is "Day 4", it's been about a week and a half since I started. But I don't get to work on it every day..sometimes just a little in the afternoon or evening! So these "days" are what I got done during that time period.